Through their social media campaign #5WomenArtists, the National Museum of Women in the Arts (NMWA) asks, “Can you name five women artists? In response to that, this month five artists with Little Rock connections will be highlighted throughout March. Up next is Marjorie Williams-Smith. Marjorie Williams-Smith has worked with silverpoint for over 30 years. Silverpoint is an especially challenging medium, but that is part of the allure. The effect of light on the silver lines creates a shimmering quality that is quite different from any other drawing medium. She draws with a metal stylus on a prepared surface. Hatched and cross-hatched lines create values and textures. The white of the page provides the contrast. Since erasing is not possible with silverpoint, every line has to be premeditated. Silverpoint is the perfect medium for the subject matter of Marjorie’s work: nature. She uses these natural forms as symbols for the spiritual energy that exists within us all. Two of her works were included in the recent exhibition: ON THEIR OWN TERMS which was on display at the University of Arkansas at Little Rock. Earlier this month, she received the Individual Artist Award at the 2019 Governor’s Arts Awards presented by Governor Asa Hutchinson and the Arkansas Arts Council. Governor Asa Hutchinson and the Arkansas Arkansas Council are presenting the 2019 Governor’s Arts Awards today in a lunchtime ceremony at the Arkansas Governor’s Mansion. In addition to videos highlighting each of the awardees and acceptance speeches, the program will feature remarks by Governor Hutchinson, Department of Arkansas Heritage Director Stacy Hurst and Arkansas Arts Council Director Patrick Ralston. The recipients will each be presented with a custom made earthenware jar made by Springdale artist Gailen Hudson. Join Historic Arkansas Museum for a reception for the openings of “Flourish,” “Olivia Trimble: Ozark Comforts” and “Featured Focus from the Permanent Collection.” Tonya Leeks and Company will be the evening’s live entertainment. New Province Brewing Company will be the evening’s featured brewery. The reception is sponsored by the Historic Arkansas Museum Foundation, with special thanks to 107 Liquor. Beverages and appetizers will be served in the Stella Boyle Smith Atrium. The exhibits and reception are free and open to the public. Olivia Trimble cares about her community, and she understands the power of words and images to lift people up or tear them down. Using the tools of a traditional sign painter, she aims to improve the urban landscape and positively impact the people of Northwest Arkansas. Trimble opened her business, Sleet City Signs, determined to recapture the excitement and individuality common to hand-painted signs of times past. The quilt square paintings she is now known for began as a simple craft project to produce a gift for a friend, but as she made more of them, the meaning of her painted quilts became more significant. Olivia appreciates the long history of quilting in Arkansas, and the many hours of hidden work contained within a completed quilt. She was invited to paint quilt squares at Crystal Bridges Museum of American Art for their American Made exhibit in 2016, and her work has appeared outside the Shiloh Museum of Ozark History, Perrodin Supply Co. in Springdale, and on many hand-painted signs around Northwest Arkansas. In honor of Black History Month, the Cabe Gallery foyer will display a selection of contemporary fine art by influential African American Arkansas artists during the month of February. The focused look includes an iconic delta landscape by Henri Linton, Larry Wade Hampton’s impressionistic scene of daily life, a country church by Glenda McCune and the delicate silverpoint realism of a Marjorie Williams-Smith still life. 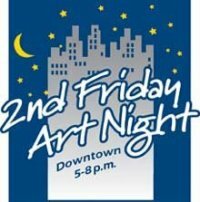 June is Busting Out All Over with great art and music downtown on 2nd Friday Art Night. Visual art, music, refreshments, a trolley for transportation can all be yours for the low price of FREE. The festivities run from 5pm to 8pm, unless otherwise noted. Old State House Museum (300 West Markham) will feature Geoff Robson and David Gerstein performing duets for violin and cello. Historic Arkansas Museum (200 East Third) will celebrate the opening of its new Arkansas Made Gallery; in addition there will be live music by Parkstone. Edge Gallery (301B President Clinton Ave) will be featuring contemporary art. Courtyard Marriott Downtown (521 President Clinton Ave) is teaming up with Spirited Art Little Rock and hosting a painting class in its cafe beginning at 6:30pm. Hearne Fine Art (1001 Wright Ave, Suite C) will host an opening reception for Reflections In Silver: Silverpoint Drawings by Aj Smith & Marjorie Williams-Smith. studioMain (1423 South Main Street) they are featuring a UALR Student Furniture Showcase. This has become an annual exhibit of furniture pieces created by students of the UALR Applied Design program.